A massive caliber that has been gaining in popularity especially in the big game hand-cannon hunting population. The incredibly large amount of versatility that the .454 Casull allows makes it a popular hunting and target round for those who like superior firepower. You can range it from down low with a 185 grain projectile for light work to a mid-range of 250 where it rivals hot .44 Magnum loads up to the 300 + grain weights where the superior energy delivery and velocities can be achieved. 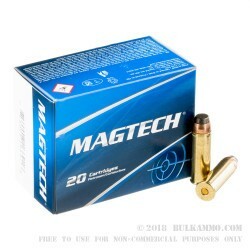 This is the MagTech load in 260 grain weight. 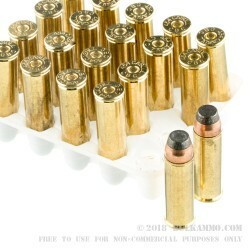 This projectile is 260 grains of soft nose semi jacketed lead based bullet loaded into a Boxer primed brass case that is of excellent quality and is reloadable: something .454 Casull shooters want in a factory load because the ammo is quite pricey. 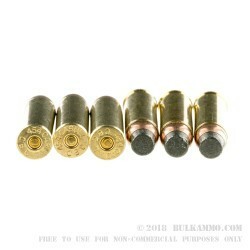 The moderate (by its own standards only) load offers 1800 feet per second velocity out of the bore and 1871 pound feet of energy at the muzzle. This is more than enough to dispatch most intermediate and large game in North America under the right conditions. And whether you use the potent .454 Casull as a backup to your high powered rifle, or as a standalone hunting handgun, this is a great round for either range practice, or even for field use on most large game. The soft tip of the bullet deforms well and creates a massive impact on any large game animal.